Elevation profile created by Zdenek on his 2014 GDT hike Thank you for allowing me to share these Zdenek! The first few kilometers aren’t included for today as they are on another chart. Today was E’s birthday! She is low key about her birthday…and we were only 23mi/37km from town. Normally, this would be a no brainer to get to town and spurge on the hotel and celebrate with a dinner out, but there were many factors involved. There is a major running event happening this weekend and we weren’t sure we’d be able to find a hotel room. It was hard enough to book tomorrow night a couple months ago. Also, E isn’t a big birthday celebrator and was neutral on pushing to town. With our preplanned itinerary, we are locked into dates and our plan was to camp just outside of town and then get a nice long nero tomorrow. Most our town days are planned that way with short mileage in to buffer for inclement weather in a leg, but it can have the reverse effect, like on this leg when we finish early enough to get to town a night early and take a full zero. 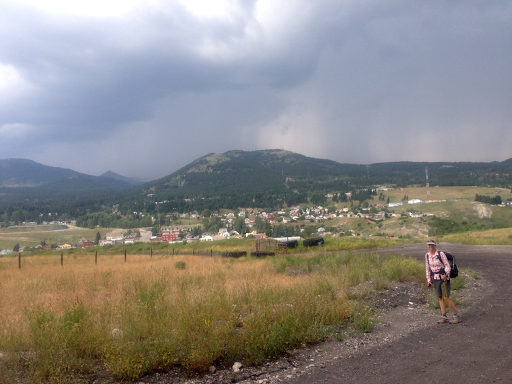 We decided to just hike and see how we felt as we got closer to town since a lot can happen over 23mi/37km. 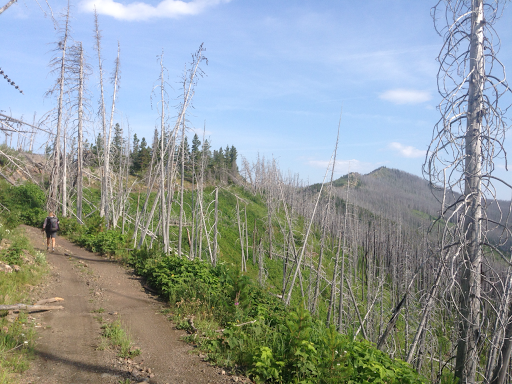 The main event of the day was Willoughby Ridge, a nice ridge walk through a burn area over a decade old. The morning started out with a lot of dirt road walking that then turned to ATV trails. 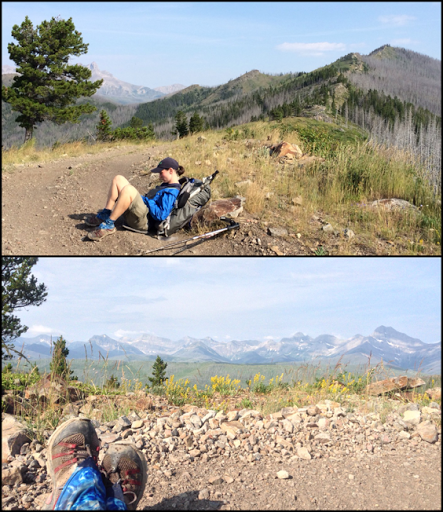 We were both groggy, hot, and in a bit of a zombie zone and missed a turn to take us up a bit to some of the ridge walk. We didn’t miss much, but a warning to others that the GPS track on the GDTA site follows the road and doesn’t do a short stretch of cross country on top early along the ridge. It was pretty hot and exposed, but breezy enough to keep it comfortable. We had some ATVers come by. It was Saturday and we were surprised not to see more. This must be a popular route. Then we made the turn to bomb down to town for the second half of the day. As soon as we turned, we lose the breeze and it was HOT. I had 80F/27C in the shade, but it was much hotter as we went down. 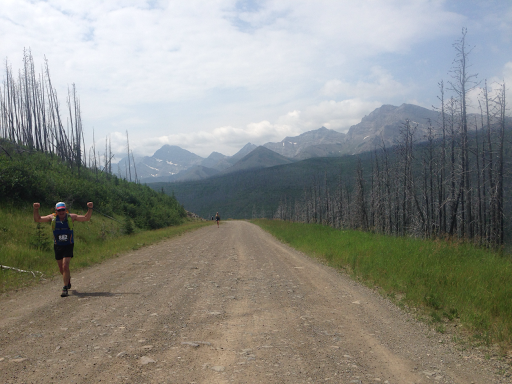 We then saw signs and realized we were hiking right along the Sinister 7 Ultra that was being run today and has the towns of Coleman and Blairmore at the height of capacity. Apparently 1,400 runners go in teams or individually to complete a 100mi/161km course with 7 stages. The stage we were hiking along, the Willoughby Ridge stage, is ranked the 6th most difficult out of the 7 stages. 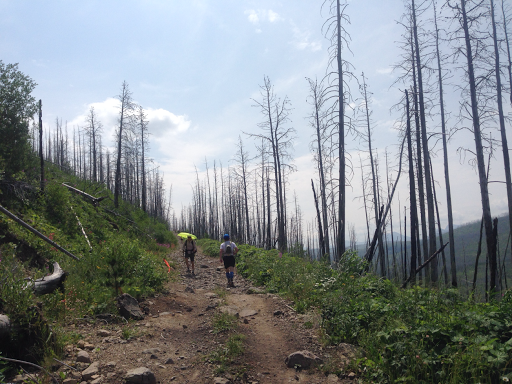 We were hiking against the grain of the ultra and saw runners consistently for at least 3hrs. There was not protection from the sun’s intensity and the elevation was either steeply up or steeply down on rocky and unlevel ATV tracks. 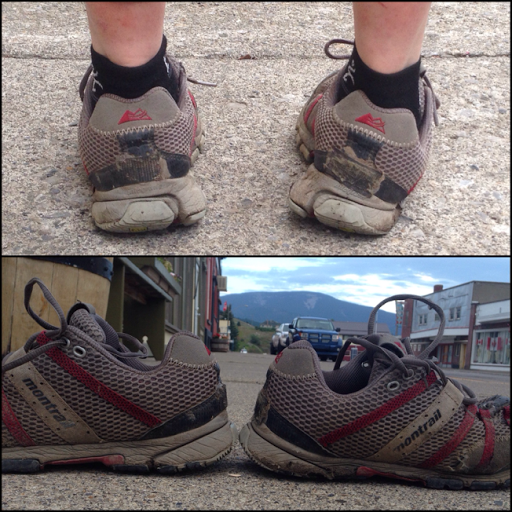 It was uncomfortable to hike and brutal to run. We tried to encourage each person and that was tiring with so many hours of passing them…but nowhere close to the exhaustion of what they were doing. We felt bad hiking with our umbrellas for relief and many commented on how they wished they had them. It was funny because many were in somewhat disbelief to see us in such heat doing this voluntarily…and didn’t seem to realize they were doing it too, ha! We realized we’d make it to town before 5pm and that we’d be golden if we wanted a to sleep in town. We waited until we got service a few miles/kilometers out and made calls to the neighboring towns of Coleman and Blairmore. Blairmore is a bigger town with a grocery store, but that would be an alternate to walk in there. Many hikers do that, but we were all set and aimed for Coleman. Only one place had an opening and we headed to town. In the last hour or two, the clouds gathered in the distance and rumbled with lightning seen on the mountains. Right as we approached town, it finally covered us and we were sheltered from the sun. Temps dropped quickly and wind picked up. Good choice to head to town! When we got to town and checked out the place that was available, it was pretty much a boarding house above a tavern with the smell of cigarette smoke embedded in everything. Now we understood why it was available. We kindly declined and walked out to look into other options. While there, a man came around the corner and asked if we wanted his wifi code. We were a little taken aback by the man’s offer after just seeing the accommodations next door and said no. It was gusty and E walked around the corner to shield from the wind when she saw a sign for Country Encounters B&B! She walked in and it was the man that had approached us. He and his wife are also caterers and very busy with this weekend’s big race. He didn’t have any space and told us we could stay in his banquet room for $25 each. Sold! How lucky! 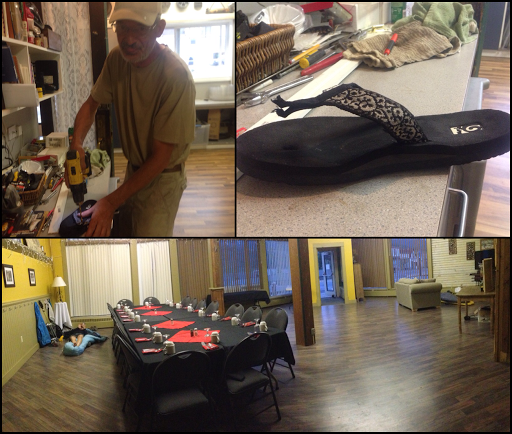 His name was Mark and he even helped me repair my broken flip flop. We drilled a hole in the shoe, used epoxy, lots of dental floss, a small washer, and my medical tape to hopefully fix em! Thanks Mark and Dawn for you amazing hospitality! They even had jars of homemade cookies that we could have with no limit. We showered as the rain came down and then headed to a restaurant for E’s birthday dinner. It was at this time that I noticed my right shoe looked funny. I have a bad right ankle and it likes to roll and I felt like it had been angling a lot that direction the last few days. I figured it was just tired and weak from the ridge and accepted it. Looking at my shoe, I realized it was the shoe and not my ankle that was the problem! Somewhere in the last day or two, the whole right side had blown out and flattened. I’ve never seen that before, but I can’t wear it that way an don’t have new ones coming for at least 200mi. Good thing I have a zero tomorrow to figure out a solution…not good! We went to dinner for E’s birthday and I was glad it was on her actual birthday. That just makes it more fun. The best restaurant in town was having a buffet that wasn’t appealing, so we went to another one nearby. Even more fun was that E’s mom was treating for this special dinner! THANK YOU Penelope! E’s hiker hunger hasn’t hit yet, so she got fish and chips and will surely take advantage with a BIG meal later this hike. I am in my full hiker hunger mode, and was able to do the special of spaghetti and steak. So hit the spot! On the way home, we both to Kit Kat Chunks for dessert. Not sold in the US and something we both really enjoy. A great ending to another great day! A birthday dinner thanks to E’s mom! 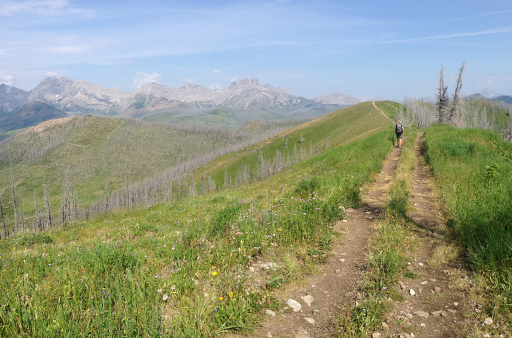 I gave a brief bio in E when we were hiking the CDT warm-up before this hike, but for those that just started following on the GDT journal, here it is again. E is now 42yrs old and has been thru hiking since she graduated college. She has hiked and traveled a lot all over the world, but the main US hikes she’s done are AT-96, CT-03, PCT-05, TRT06, LT08, AZT-07&11, CDT-13. E has a unique job as an ice core driller (occasionally a science technician) and generally has contracts for Antarctica or Greenland for 3mo at a time 1-2 times a year. When not doing that, she and her boyfriend Andy(who works with NOAA also in these locations) have homes in New Zealand and Moab. Yep, quite the travelled life. Zero day tomorrow and a special Canadian guest!…Who could it be?? ?